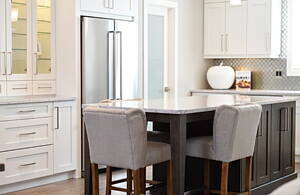 Luckily, there are plenty of kitchen manufacturers in Derby (Derbyshire) to work with you in the kitchen floor plans to achieve the style you are looking for and advise you with kitchen decorating ideas. They are able to provide nice kitchens whatever your tastes are, either you want a wooden kitchen makeover by placing log furniture or the most modern kitchen. At Infoisinfo we always work hard to be able to offer you the most useful information so that you can easily find the best products and services for you or your company in Derby (Derbyshire). We know how happy your new home project makes you and we’d like to give you a hand with the kitchen. This room must be considered the heart of a home and we are sure that you will like to have one that you love. For this reason, we have prepared a list of the best kitchen manufacturers in Derby (Derbyshire) for you to choose from whatever your preferences are, from small kitchen layouts to a luxury kitchen.